The Commodore computers of the eighties are growing ever older, yet many continue to enjoy them. 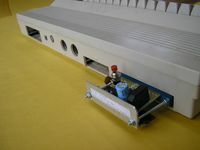 Faulty power supplies can be the cause of instability and failure in all computers, the Commodore Power Monitor plugs into the User Port of the Commodore VIC-20, C64, C128 and Plus4 and warns if the voltages from the external power supply are significantly out of spec. or contain problematic ripple voltage. These devices are sold as pictured above, without a case but with a metal support for the circuit board. They are sold fully assembled for $22.00 AUD (Australian Dollars) each. *The 5VDC LED may show a false warning under some circumstances when used with the Plus4. See the "Usage" section below. Orders may by made by Email to , or for an increased price from Ebay. I will reply with a confirmation of your order, after which you may pay using a method stated below. For International orders, I can only accept PayPal for payment. My PayPal address will be provided upon confirmation of an Email order. For Australian orders, I can also accept Mail Orders. Additionally, I'll also take cash from anyone willing to pick up their order from Ombersley, Victoria, Australia (he he...). This image shows locations of the three warning LEDs: 9VAC, 5VDC and RIPPLE. Insert the board into the User Port, pressing on the support across the back. When the computer is turned on, the 9VAC LED should light, showing that the board has made contact and the computer's 9VAC supply is not significantly low. The 5VDC LED may momentarly flash as the voltage stabilises, after this only the 9VAC LED should remain on if the voltages are within the tollerances stated below. If the 9VAC LED doesn't light, ensure the monitor is fully inserted into the User Port, and that the User Port contacts are clean. The voltage ranges indicate the potential range over which a warning may occour, temperature and component variation affect the exact triggering voltage, but the warnings give an indication in case of a significant voltage regulation failure which could cause damage to chips inside the computer. Note that the device is designed to perfom to these specifications only when the ambient temperature is between 10° C - 38° C (18° F - 68° F). Low 9VAC levels (as indicated by the 9VAC LED) may also cause early triggering of the RIPPLE warning. The power supply for the Commodore Plus4 computer is reported to be set to output 5.2V normally. This means that a 5VDC warning may occour when all power supply components are still working within spec (because the specifications for the voltage regulator allow up to 0.25V above the target voltage). Also note that some Commodore computers were sold with power supplies only just big enough to power the computer, and the 9VAC voltge can drop even under normal load. 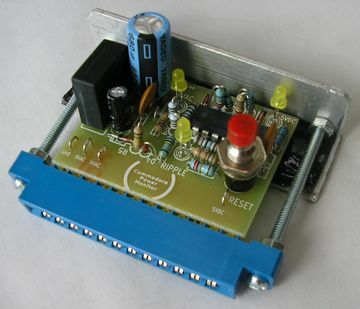 A design for a DIY Relay Power Cut-Off triggered by the 5VDC HIGH warning is also available. The 5VDC voltage levels were chosen to protect the 7400 series TTL Logic ICs and the DRAM ICs, as these are rated for operation over the lowest voltage range of the chips used in the supported Commodore computers. Many larger CMOS ICs used in the computers are rated between under 1V and 7V or higher. 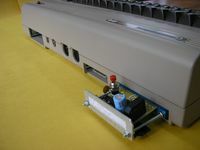 The value used for the Ripple alert was derived from the "High Level Ripple Margin" of Standard TTL 7400 series Logic ICs which are used in some of the supported computers. This specifies the amount of noise able to be carried on signal lines before it can cause errors and instability.